One of the methods the Israel lobby uses to silence comparisons between their decades long maltreatment and ethnic cleansing of the Palestinians and the Nazis’ persecution of the Jewish people, culminating in the Shoah – the Holocaust – to proclaim very loudly that such comparisons are hurtful and particularly offensive to them as Jews, the Nazis’ victims. This doesn’t mean that the comparisons aren’t there. Critics of Israel have pointed out that Israel’s policies towards the Arabs certainly does resemble the Nazi persecution of the Jews up until 1942, when Hitler and the rest of his murderous gang decided on the infamous ‘Final Solution’. The Conservatives and other, self-proclaimed opponents of ‘Political correctness’ have made it very clear that hurt feelings should not be used to silence plain speaking and honest debate. This is true, although by plain speaking it usually means standing up for the type of people, who see nothing wrong with using racist epithets and making very racist remarks about Blacks, Asians and any other ethnic groups they don’t like. See the mouthings of the Daily Mail on this issue for further information. But the Jews weren’t the only people the Nazis regarded as subhuman. They also despised the Slavonic peoples of Eastern Europe. Hitler made it very clear that in his invasion of Poland, Ukraine and Russia, he was merely continuing the medieval ‘Drang Nach Osten’, or ‘Drive/ Penetration to the East’ of the German medieval kings to conquer the Slav tribes. Prussia was one such state to be Germanised through conquest during the Middle Ages. The Pruzzi, from whom the German state took its name, were a Baltic tribe, and the area was also occupied by the Wends, a Slav people, whose language still survives today around the town of Cotbus in the former East Germany. They also waged war against the Poles. This finally ended with the collapse of Poland in the 17th century, and its annexation by Prussia, Austria and the Russian Empire. Hitler’s plan for the conquered eastern European territories was to establish a series of German colonies in areas seized from the indigenous peoples. In those areas free of colonisation, the Slav peoples were to be reduced to an uneducated, peasant class, who would provide their German masters with foodstuffs. Hitler’s primary aim in eastern Europe was to found a series of new German colonies. In the former Polish territory, which had been annexed by the Reich in 1939 a start was made in resettling German refugees from the Baltic States and eastern Poland, which had reverted to Russian rule in 1939-40. By 1943 the RKFDV had expelled about a million Jews and Poles and brought in roughly the equivalent number of ethnic Germans, of whom only about half were settled on the land. The remainder spent the war in refugee camps. Hitler wished to reduce the Polish population to a semi-illiterate mass whose main function would be to serve the interests of Greater Germany, and to allow the economy to deteriorate into what he called ‘the Polish chaos’. (p. 63). As a result of the September Campaign, the whole of Poland passed under the occupation of Nazi and of Soviet forces. the Polish government and High Command took refuge in Romania, and on 30th September, a new Government was constituted abroad under General Sikorski, first in France, and later in England. On the western side of the Nazi-Soviet demarcation line along the Bug and the San, the Germans established a ‘General Government’ with its headquarters in Cracow. May districts of pre-war Poland, including Suwalki, West Prussia, Wielkopolska, and Upper Silesia, were directly incorporated into the Reich. (P. 65). According to the outlines of the Generalplan-Ost, the Nazi aimed to redistribute the entire population between the Oder and the Dneiper. German settler were to be introduce by the million. the Poles were destined either for Germanisation where suitable, or for expulsion beyond the Urals. The residual Slavs were to be turned into a pool of half-educated slave labourers. Inferior or useless human beings-Jews, gypsies, recalcitrant prisoners of war, imbeciles and invalids-were to be eliminated…. German resettlement schemes were already under way in West Prussia,, where 750,000 Polish peasants had ben expelled to make way for Germans transferred from the Baltic States. Now the same methods began to be applied in central Poland, notably in the region of Zamosc. In 1942-3, over 300 villages were cleared in this region alone. There remained 400 villages intact simply because the SS could not spare the manpower to clear them. The evictions were attended by unspeakable burnings, beatings and butchery. The well-known fate of the one Bohemian village of Lidice, where 143 men were murdered by a Nazi reprisal order, was visited on Poland not once, but hundreds of times over. 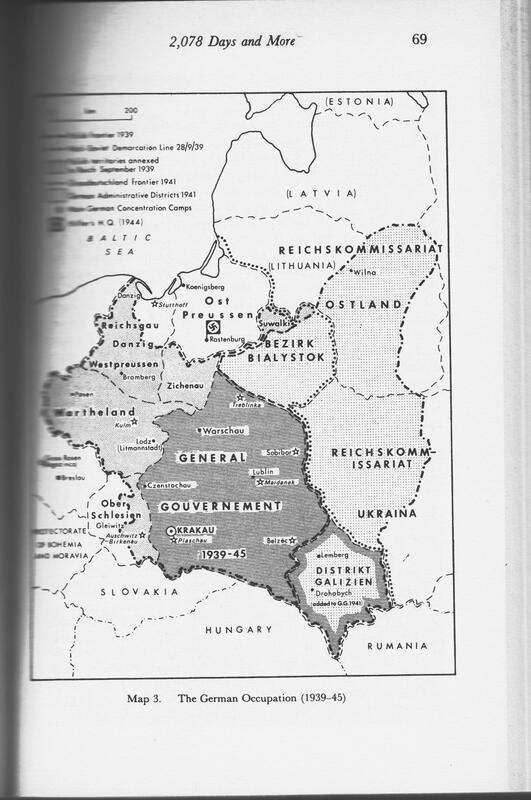 Map of Nazi occupied Poland, from Davies’ Heart of Europe, page.69. Okay, there are some major differences between the Israeli ethnic cleansing of the Palestinians, like the Nazis and the Nazi occupation of Poland, quite apart from the fact that they haven’t set up death camps to murder them as they did to Polish Jews. The Israelis aren’t interested in retaining the Palestinians as an enslaved peasant class. They just want to expel them. But this has been done through massacre, land seizures and horrific persecution. And Gaza has been compared to a wartime Jewish ghetto. I am in no doubt that such comparisons will be just as unpalatable to the Zionist lobby in this country, as the comparisons to the Nazi persecution of the Jews before 1942 and the ‘Final Solution’ are. But that does not mean that they aren’t there, and valid. The truth often hurts, but real history, not propaganda, is about facing up to them, to explain and explore history and recognise what really happened in the past. Not to purvey cosy, patriotic myths about what we’d like to believe happened. This applies to everyone, regardless of nationality, religious creed or race. Screaming that the comparisons between the Nazi occupation of Poland and the ethnic cleansing and enslavement of its people, or claims that such comparisons must be anti-Semitic aren’t arguments. It’s just more libel and abuse. It’s time for Israel’s supporters to wake up to the facts, and stop their support for Israeli imperialism, apartheid and ethnic cleansing.